A music-making game and technology installation that allows anyone to create a music track and video in just six minutes has been unveiled. 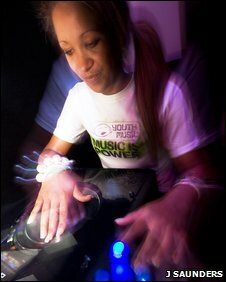 Youth Music Box allows four people - of any age and musical ability - to play electronic instruments and collaborate on digital music projects. Finished pieces are uploaded to a music sharing website. The system has been developed by music charity Youth Music and was unveiled at London's Southbank Centre on Friday. It will remain in the capital until September, when it will travel to Bristol and then Gateshead. The project is to celebrate the 10th birthday of the Lottery-funded charity, which exists to get children up to the age of 18 interested in music. Many children first presented with an opportunity to make music are daunted by the complexity of playing a traditional instrument. "We've found that for a lot of kids that their first go at making music is via technology," explained Youth Music's Michelle James, "and over the last couple of years that has meant kids playing console games like Wii Music and Rock Band." "We did some research that demonstrated that a large proportion of those young people trying out music games were inspired to go off and learn an instrument. "We were looking for a way to capture that and make it available publicly over the summer holiday so loads of kids can come in and try it out." Youth Music contacted music-based design agency Silent Studios and interactive artist Chris O'Shea to come up with a project in which kids of any age can make music, without having any training. Inside the box is a seamless mix of high-tech instruments built into a round table: two electronic keyboards, electronic drums, and a digital turntable. Four people sit down at the table and are offered six music genres to choose from to make their song, providing them with a basic rhythm to start with. "We did a lot of testing with this and for non-musicians, if it's just about playing an instrument they get turned off really quickly," said Nathan Prince, Silent Studios' creative director. "They don't know how to structure a song or to write a melody. I didn't know how to create a beat, for example. So you need a certain amount that's a given that you can paint on top of." What makes the instruments playable for anyone - and the resulting music to sound good with ease - is that the rhythms, percussion, and instrumental and vocal samples have been recorded by 15 professional musicians. Each key on the keyboard launches samples that fit the chosen genre and were written to work together melodically. "It's kind of a rhythmic game with a musical output," said Mr Prince. 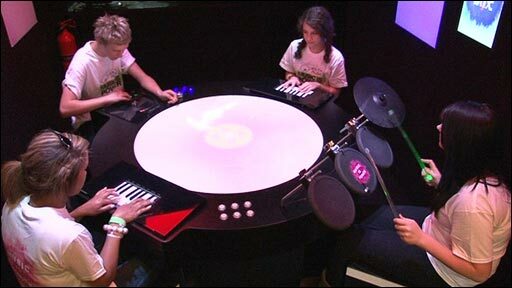 Adding to the experience are the visual effects that happen in the middle of the table as the instruments are played. Each sound is accompanied by a stream or explosion of colourful pixels near the instrument, projected onto the table from above. "We really wanted something that had a real audio-visual effect. "We felt that if it was just music alone, it was just half the story," Mr Prince said. After two minutes of practice with the instruments, recording begins and remotely controlled cameras in the box film the proceedings. During the one-minute recording, two technicians behind the scenes do a live video and audio mix, making a complete music video that is uploaded straight to the Youth Music website. "It's almost like [a theme park] where you get a photo at the end of the ride - we wanted to do that in a way that's more shareable."